JP Morgan Chase is the latest financial institution to own up to a data breach. According to reports, the breach affected 2% of the customers of one of the bank’s payment card products. That doesn’t sound such a big deal until you realise that the breach happened against a product called UCARD, of which it seems that 25,000,000 have been issued. That makes it a pretty big breach when measured in absolute terms, with JP Morgan Chase having to contact 465,000 customers to warn them what has just happened. Except that it looks as though it hasn’t “just happened”. JP Morgan Chase’s own sites don’t seem to be saying, but stories already published seem to agree that the breach happened in July 2013; the bank realised in September 2013; and the notification has only followed now, in December 2013. 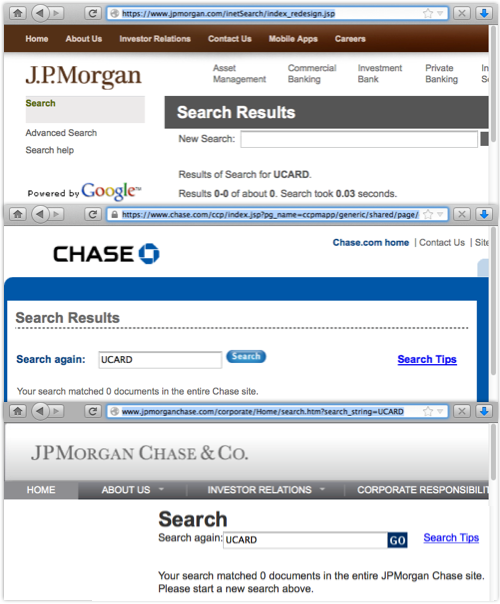 If, like me, you’re not from the USA, you might never have heard of UCARD – and, like me, you might have struggled to find out anything about it if you tried searching in the obvious places, such as jpmorgan.com, chase.com and jpmorganchase.com. 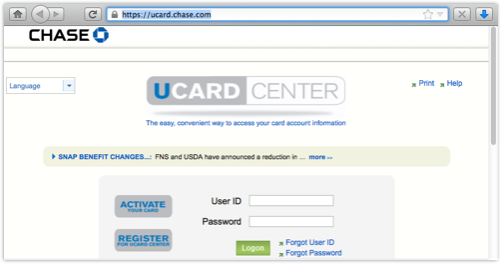 All we’ve been able to work out so far is that the UCARD CENTER website shown above seems to have been renamed from EBT ACCOUNT, and EBT stands for Electronic Benefit Transfer, which is pretty much what it sounds like – a way to get paid your food stamps and benefit cheques. Briefly put, UCARD is welfare done digitally. Data breach happened in July. Noticed and reported to relevant authorities in September. Reported to affected customers in December. Close to half-a-million cardholders affected. Still not sure what data was stolen. Some personal data exposed in unencrypted temporary files. Only the UCARD product affected. Affected customers get 12 months’ free credit monitoring. Most of this, sadly, is a script you could probably have written yourself, through familiarity with all-too-many previous breach stories. The sting in the tail – and the big lesson to take away in this case – is the issue of unencrypted temporary files. Reuters suggests that the unencrypted data “appeared in plain text in files the computers use to log activity,” and that is probably a data leakage risk that affects many companies. Financial transactions need scrupulous auditing, and that means keeping an accurate record somewhere of what happened, and when. But logging can be a security risk as well as a benefit – you should be encrypting personally identifiable data both at rest (when it is written to disk) and on the move (as it flows across the network). If you’re logging sensitive data, don’t wait until it reaches its final destination before encrypting it. Public key cryptography makes it comparatively easy to protect logging data from snoopers and thieves in an end-to-end fashion, thus ensuring that it is encrypted everywhere along the way. → By the way, the potential for data leakage via temporary files is one reason why it is recommend you use FDE, or Full Disk Encrpytion, for your laptop or mobile device, rather than just encrypting your home directory. If everything is encrypted, you don’t have to worry that one or two odd or out-of-the-way files might not be.